The Manila softball team, SMB coach Leo Austria and Milan Melindo join seven other major awardees in the PSA event. TWO world champions and one of the country’s most accomplished coaches will be the recipients of major awards in the coming SMC-PSA (Philippine Sportswriters Association) Annual Awards Night. Team Manila and former International Boxing Federation (IBF) light-flyweight title holder Milan Melindo, along with three-time Coach of the Year Leo Austria join seven other individuals who will be recognized for their exemplary accomplishments that left a lasting impact on Philippine sports in the year just passed. 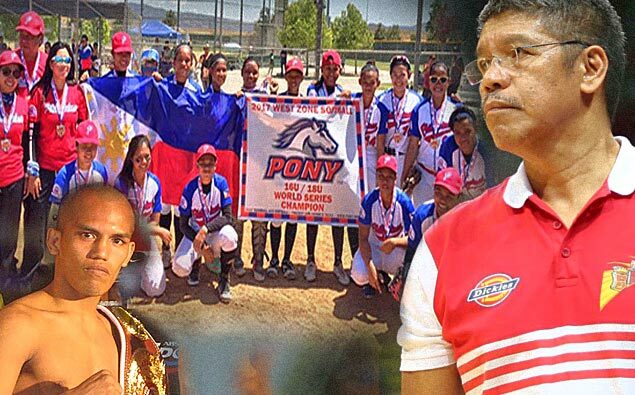 The team of coach Ana Santiago which ruled the Pony International 18-U Girls Softball World Series in California is the major awardee in softball; Melindo gets the same honor in boxing while Austria, the humble and soft-spoken mentor of the fabled San Miguel team, is the awardee for pro basketball to be handed out by the country’s oldest media organization during its traditional gala night presented by MILO and Cignal TV. The formal affair will be held Feb. 27 at the Maynila Hall of the historic Manila Hotel. Cager Thirdy Ravena (amateur basketball), tracksters Eric Shauwn Cray, Mary Joy Tabal, and Trenten Anthony Beram, car racer Masato Fernando (motorsports), and the racing duo of John Alvin Guce (Jockey of the Year), and Triple crown winner Sepfourteen (Horse of the Year), make up the compact list of major awardees to be recognized in the annual rite whose major sponsor is the Philippine Sports Commission (PSC) and supported by Mighty Sports, Rain or Shine, Globalport, and the Philippine Basketball Association (PBA). All of them share center stage with world champions Jerwin Ancajas, Krizziah Lyn Tabora, and Carlo Biado, who will be honored with the PSA-Tapa King Athlete of the Year awards. Team Manila dethroned Central Hernet Xplozion, 7-1, in the title game of the World Series held at the Diamond Valley Park to become the first team from Asia to rule the tournament, according to Rodolfo Tingzon Sr., the founder of Pony in the country. Melindo on the other hand, won the IBF title belt following his first-round upset of former champion Akira Yaegashi in their 12-round fight at the Ariake Colosseum in Tokyo, Japan. He subsequently defended the crown with a dramatic split decision against Hekkie Budler in a bloody, hard-fought encounter at the Waterfront Casino and Hotel in Cebu. Until he lost in his unification fight against Japanese Ryoichi Taguchi on New Year’s Eve, Melindo, 29, was a strong contender for the Athlete of the Year honor. For his part, Austria run away with a third straight Coach of the Year award to become the first man to keep the Virgilio ‘Baby’ Dalupan perpetual trophyhanded out by the PBA Press Corps. The 59-year-old coach from Sariaya, Quezon came a championship short of accomplishing a rare grand slam for San Miguel, which earlier won the Philippine Cup and Commissioner’s Cup, respectively.